Our favorite designer looks to get you through the holidays in style! Max Mara Cropped Stretch-Wool Crepe Straight-Leg Pants ($675) at Net-A-Porter.com, Max Mara Two-Tone Silk and Cashmere-Blend Sweater ($595) at Net-A-Porter.com, The Row Bare Leather Sandals at Net-A-Porter.com, Majorica Baroque Pearl Collar Necklace ($195) at SaksFifthAvenue.com, Loeffler Randall Mini Minimal Rider Leather Crossbody Bag ($350) at SaksFifthAvenue.com. Roland Mouret Maltock Stretch-Crepe Dress ($1,365) at Net-A-Porter.com, Manolo Blahnik Tucciototo Suede Pumps ($995) at Barneys.com, Fallon Monarch Tuxedo Bow Hoop Earrings ($290) at SaksFifthAvenue.com, Isabel Marant Crystal-Embellished Suede Bracelet ($275) at Net-A-Porter, Gucci Dionysus Leather Mini Chain Shoulder Bag ($830) at SaksFifthAvenue.com, Karl Donoghue Shearling Scarf ($355) at Net-A-Porter.com. St. John Sequin Trellis Sheath Dress ($1,695) at SaksFifthAvenue.com, Chanel Earrings ($700), Valentino Garavani The Rockstud Metallic Textured-Leather Shoulder Bag ($1,345) at Net-A-Porter.com, Stuart Weitzman Nudistsong Ankle Strap High-Heel Sandals in Platinum ($425) at StuartWeitzman.com. 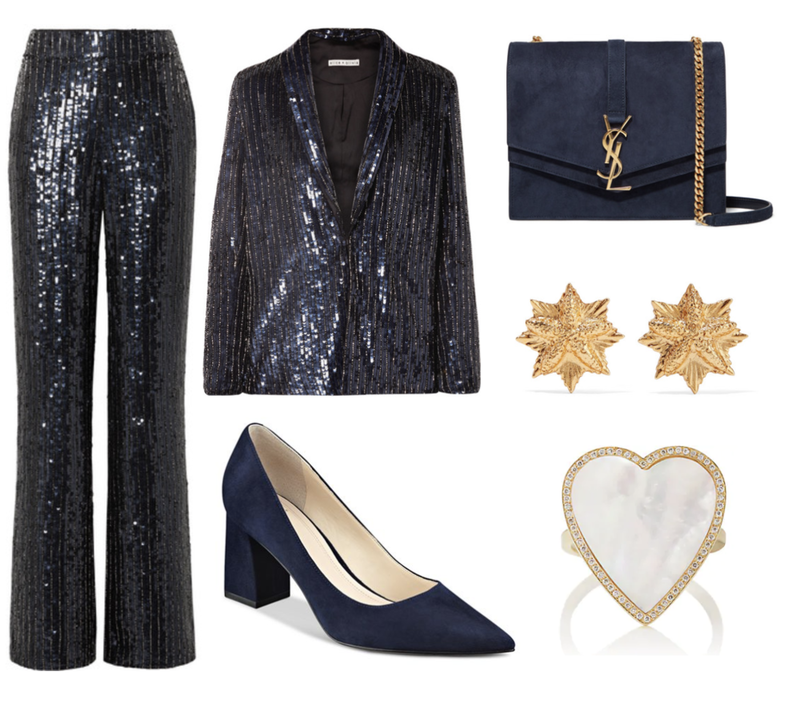 Alice + Olivia Jace Oversized Sequined Satin Blazer ($695) and Alice + Olivia Racquel Sequined Satin Wide-Leg Pants ($550) at Net-A-Porter.com, Marc Fisher LTD ‘Zala’ Pump in Navy Suede ($159) at Nordstrom.com, Saint Laurent Sulpice Medium Suede Shoulder Bag ($2,590) at Net-A-Porter.com, Oscar De La Renta Gold-Plated Earrings ($190) at Net-A-Porter.com, Jennifer Meyer Mother-Of-Pearl & Diamond Heart Ring ($3,750) at Barneys.com. Something Navy Skinny Slit Hem Pants in Beige Whisper ($79) at Nordstrom.com, Jenni Kayne Fisherman Crewneck Cashmere Sweater in Ivory ($395) at Nordstrom.com, SJP by Sarah Jessica Parker Women’s Bliss Leather Slingback Kitten Heel Pumps ($325) at Bloomingdales.com, Coach 1941 Croc-Embossed Turnlock Chain Crossbody Bag ($225) at NeimanMarcus.com, Halogen Molten Statement Collar Necklace ($59) at Nordstrom.com. Alice + Olivia Abigail Wrap Dress ($495) in Leopard Rose at Nordstrom.com, Coach Bowery Chelsea Bootie in Cognac Suede ($294.95) at Nordstrom.com, Zoe Chicco 6MM White Pearl & 14K Yellow Gold Threader Drop Earrings ($175) at SaksFifthAvenue.com, Lauren Ralph Lauren Chain Necklace, 18” ($54) at Bloomingdales.com, Tory Burch Piper Large Suede Saddle Bag ($328) at Bloomingdales.com. Alice + Olivia Delaina Sequin Top ($285) at Nordstrom.com, Theory Demitria 2 Stretch Wool Suit Pants ($295) at Nordstrom.com, Badgley Mischka Hannah Embellished Ankle Strap Sandal ($215) at Nordstrom.com, Rebecca Minkoff Small Love Leather Crossbody Bag ($195) at Nordstrom.com, Majorica Classic 14MM White Pearl Stud Earrings ($110) at SaksFifthAvenue.com, Dannijo Vivianne Cocktail Ring ($195) at Bloomingdales.com. Alice + Olivia Cecilia Drape-Shoulder Midi Dress ($395) at SaksFifthAvenue.com, Eliza J Faux Fur Capelet ($98) at Nordstrom.com, Marc Fisher LTD Elia Pump in Black Suede ($159) at Nordstrom.com, Kate Spade New York Reese Park Crossbody Bag ($378) at Nordstrom.com, Valentino Rockstud Leather Bracelet ($195) at SaksFifthAvenue.com, Baublebar Beaded Link Hoop Earrings ($42) at Bloomingdales.com. A.L.C. Hanson Sequin Trousers ($445) at SaksFifthAvenue.com, Parker Tabitha Iridescent Sequin Blazer ($598) at SaksFifthAvenue.com, Sam Edelman Tatiana Pump in Black Suede ($119) at Nordstrom.com, Coach Smooth Leather Flap Wallet ($195) at Nordstrom.com, Badgley Mischka Stud Earrings ($68) at Nordstrom.com, Adriana Orsini 18K Goldplated Sterling Silver Statement Ring ($170) at SaksFifthAvenue.com. Parker Black Petra Sequin Dress in Sand ($538) at SaksFifthAvenue.com, Tory Burch Imitation Pearl Drop Earrings ($128) at Nordstrom.com, Loeffler Randall Collette Hinged Pouch Bag ($295) at SaksFifthAvenue.com, Stuart Weitzman Starla Strappy Slingback Sandals ($395) at SaksFifthAvenue.com. We hope the holidays are filled with lots of friends, family and fashion! Happy Holidays from the Lily Winston Team!